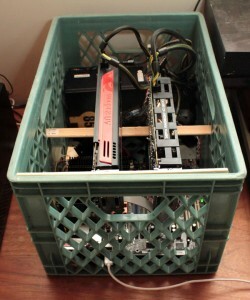 My new computer in a crate serves a very different purpose from any other you’ve probably ever seen. It manufactures money. You’re looking at barebones computer heavily focused on graphics card processing. This sort of machine is specifically designed to perform a mind bendingly large number of calculations per second. Graphics card heavy computers like this are useful for rendering 3d video, folding proteins at home, guessing passwords, or for “mining” a cryptocurrency like Bitcoin. Bitcoin and its cousins are “crypto currencies.” They’re a type of online payment system that doesn’t require a central financial authority to work. 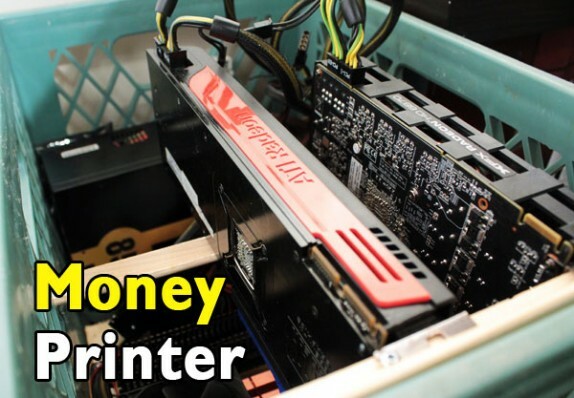 Sort of a “digital cash.” Having a mining computer means that anybody with power and an internet connection can print their own money. And at least for now, it’s all perfectly legal. I’m using my machine to mine for some of the newer currencies such as Litecoin and Dogecoin which can still be mined with standard computer equipment. Big Papa Bitcoin is so popular already that mining it requires highly specialized equipment from ASIC. The small mining computer I’m showing works at 700,000 hash-per-second, or 700 kilohash. Earnings depend on a number of factors, but as of March 2014, a 700 kh/s setup can mine around 5000 dogecoins a day. That’ll liquidate on the open market for about 6$. Costs are about 15% of earnings – $0.86 a day for the electricity to run it. What’s Wrong with the Computer I Already Have? Maybe nothing. 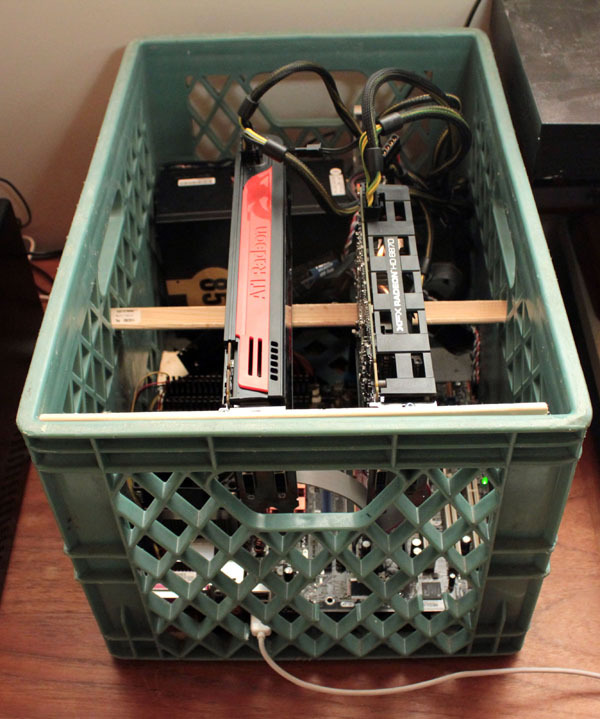 The simplest way to start mining digital cash is to use whatever equipment you already have. If you have a modern desktop with a dedicated graphics card, you might even do pretty well. Laptops aren’t usually recommended because mining creates more heat than ordinary computer use and a laptop hasn’t got the airflow to properly cope. You can even mine coins without having a graphics card. You won’t get as high a hash rate, but you can use a CPU miner on pretty much anything – even an old desktop from the late 90s if you really wanted to. For example, I mine on off hours with my original 5 gallon computer from the cable management article. It’s paying out about 1$ a day, which means it can buy itself a twin after another 2 years of work. How’s that for a computer replacement program? But for building a more serious income from cryptocurrency mining, you’ll be better served by setting up a dedicated machine. Creating your own computer from parts is a fun money-saving adventure if you know what you’re doing, but if you’ve never squinted into the depths of a desktop before to replace that danged CMOS battery, it’s probably best to hire a nephew or something to assemble this for you. I’ve linked everything to the cheapest price on Amazon or given instructions on where else to find it. Processor: Intel Celeron G470 for $30. One of the cheapest modern processors you can buy. A mining computer does not need a powerful processor so save the money and the wattage by buying the lowest end reliable unit you can find. Motherboard: GA-H61M-S1 for $50 It’s important to select a motherboard with plenty of graphics card slots, also called PCI Express slots. This one has 3 total, which is about the max you can run off a single power supply.Best of all it’s small and will easily fit in a milk crate if you care as little about aesthetics as I do. Power Supply: Apevia 700W for $40. 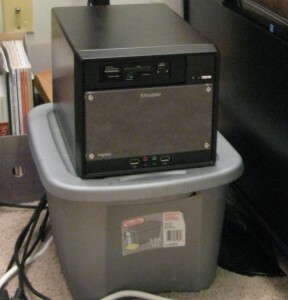 Power supplies convert power from the wall into usable power for a computer. This model has 2 graphics card (pci-e) connectors included. When you buy your graphics cards they should come with the right adapters to create a third power plug. With everything running, this card should run at 75% capacity. Graphics Cards: 3x R9 270s for $200+ each. Graphics cards are by far the most important component. Everything else is here just to make the graphics cards work right. The R9 270 isn’t the most powerful card out there by a long shot, but it’s the best for performance to price and energy efficiency. Don’t forget you need three total! These cards are in high demand so prices and availability will vary. Note: A few different companies make R9 270s. The highest performers seem to be Sapphire and Gigabyte but cards from any manufacturer will still work. Risers: Two 1x-16x Risers for 6$+ each. These cables will connect your motherboard to your graphics cards. They make sure your cards are surrounded by a cool cushion of air instead of sweltering elbow-to-elbow with your other components. Drive: 16 GB USB Drive for 12$– This is where your operating system lives – either Windows or Linux. You can also buy a small hard drive or use an old one you have lying around. Ram: 1GB PC-10600 RAM minimum for $10+ each. – I use Windows 7 so I needed more ram for mine but you can get away with just 1 GB if you use a special version of Linux designed for coin mining such as BAMT or XUBU. With windows you probably need closer to 6 GB of RAM. Based on current prices, this machine will cost a total of $754, or $0.57 per kilohash. Optimized properly, it can earn between 7$ and 14$ a day, paying itself off in 2-3 months. Crytocurrencies like Bitcoin are less than a decade old, and the market is far more volatile than the stock market. Fortunes are both made and lost in an instant. This gut wrenching roller coaster shows Bitcoin’s price over the last 12 months. I’ve personally tried to reduce my risk by mining then selling the currency rather than playing the “buy, hold and pray” strategy. Don’t consider anything on this page as advice about what you should do, just as one guy’s first steps into digital coinage. What can I Do with Crypocoins? Cryptocurrency is designed as an internet currency so it’s most useful online. You can tip your favorite website or youtuber with it, send money overseas without any transfer fees, or hire services on a coin job board. Overstock.com was the first major online retailer to start accepting bitcoin. And you can always sell your currency for dollars at an exchange, although the recent disappearance of one major exchange should tell you not to leave your coins in the exchange for any length of time. The best place to start your crypto journey is the Get Started with Dogecoin article on Dogecoin.com. They’ll start you up with your first wallet and show you where to find some free coins to start filling it. If you want to start mining with your graphics card, check this hardware list on litecoin.info to see which mining utility will work best. To mine on a CPU, just go get CPUminer.exe and away you go! I’ll also respond to any questions left in the comments. For those of us who are totally computer inept, why don’t you make money by putting these computers together and selling them? I’d probably but them if I knew exactly how to run them.